These homemade brownies are chewy, fudgy and perfectly chocolatey. 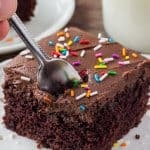 They’re made from scratch with cocoa powder and other simple pantry ingredients – so it’s the perfect easy brownie recipe. Brownies should be fudgy, chewy, chocolatey but not too rich, and extra thick – and this homemade brownie recipe is all of those things. 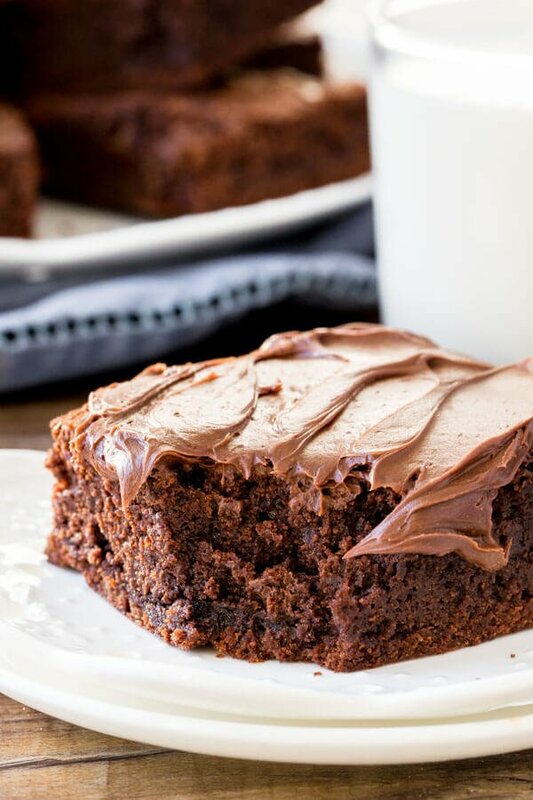 There are a few recipes that I think everyone should learn to bake, and brownies are definitely one of them. There’s nothing like a moist, fudgy homemade brownie. And after trying this easy recipe, you’ll never use a box mix again. 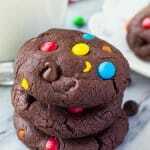 I’ve made a lot of brownie recipes in my day – but I wanted a simple, from-scratch brownie recipe without any fancy ingredients. The kind of brownies you remember your Mum or Grandma making when you were a child. The kind that are chocolatey, fudgy, not too rich, and extra delicious. The kind that can be filled with walnuts, topped with ice cream, or frosted. And that’s exactly what these homemade brownies are. Ok – after a ton of recipe tests, here’s what I found gave the best results. 1 1/4 cups butter (2 1/2 sticks). 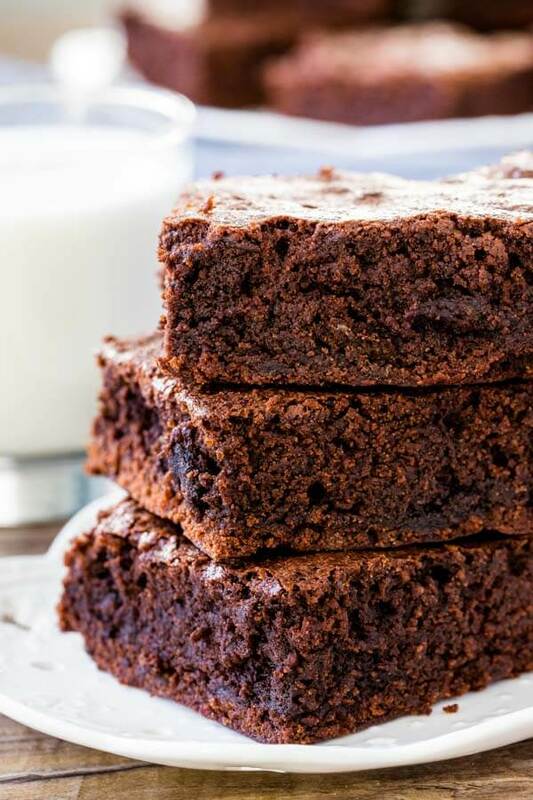 Some brownie recipes use butter and others use oil. I found that brownies with butter had a far superior flavor. 1 1/4 cups cocoa powder for the chocolate flavor. I wanted these homemade brownies to use cocoa powder because it’s a simple ingredient, and people are more likely to have it in their kitchen instead of baking chocolate. I also love the flavor of brownies with cocoa powder because it’s rich without being overpowering. 2 1/2 cups white sugar. It sounds like a lot, but trust me on this one. 4 large eggs. Eggs help to bind the batter together and also create a chewy, moist texture. 2 teaspoons vanilla extract – always necessary. 1 1/4 cups flour. Too much flour and your brownies get dry, not enough and they won’t hold together. 1/2 teaspoon salt to balance out the sweetness. optional chocolate chips or chopped nuts to mix in. So What Makes Brownies Fudgy? It’s all about the fat! Fudgy brownies have a higher ratio of fat to flour, whereas cakey brownies have more flour in them. More fat means that the brownies are dense, fudgy, and somewhere in between a chocolate truffle and a piece of chocolate cake. How do You Make Cakey Brownies? If you prefer your brownies lighter in texture, you can still use this recipe. Simply use 1 1/2 cups flour instead of 1 1/4 cup and add 2 teaspoons of baking powder as well. The baking powder helps the brownies rise. 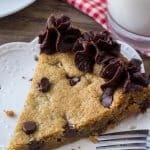 Along with the extra flour, you’ll get brownies that are a little lighter in texture and more similar to a piece of cake. I’d also recommend baking them a little bit on the longer side so that they’re less gooey. Chewy brownies are somewhere in between super fudgy brownies and cakey brownies. They’re moist, tender, chewy and not too rich. They’re fudgy without being super gooey or underbaked. Which is exactly what we’re making today. Should Brownies Bake in a Metal or Glass Pan? You can bake brownies in either a glass or metal pan. A metal pan makes brownies have crispier edges. If baking your brownies in a glass pan, they’ll take longer to bake – as much as 5 extra minutes. Melt the butter and cocoa powder together first. This helps to bring out the chocolate flavor. Whisk the eggs and sugar together separately. This adds air and volume to the eggs. Your brownies will be taller, have crinkly tops, and the most delicious creamy, moist centers. Gently fold in the flour using a rubber spatula. Do not overmix the batter. The more you mix the flour the more gluten is created. More gluten = drier, tougher, brownies. Bake times vary – so watch carefully. Brownies baked in pyrex or glass pans take longer to bake than brownies in metal pans. Start testing earlier rather than later to be on the safe side. When your brownies are done the top should look set and an inserted toothpick will come out with a few damp crumbs but shouldn’t look wet. If you gently press on the top with your finger they should feel set (not wobbly under your fingers). Peanut Butter Frosting if you want to change things up! 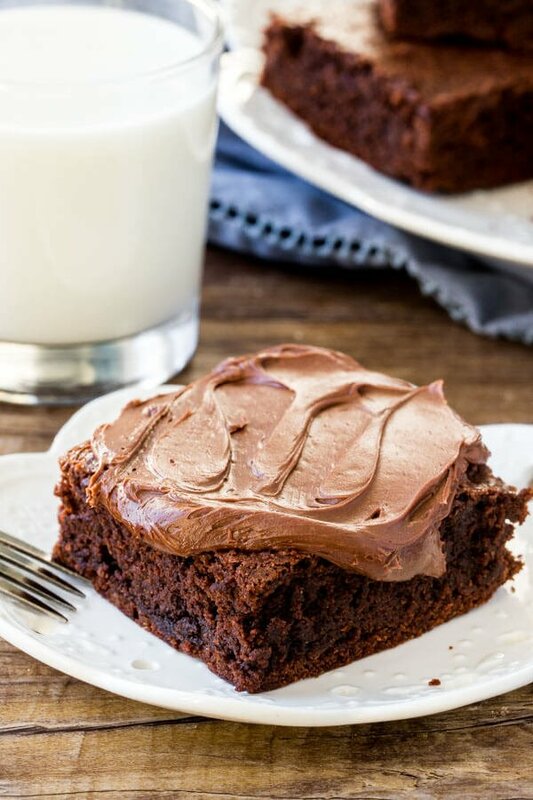 These homemade brownies are seriously delicious and everything you could ever want in a brownie. Fudgy, filled with chocolate, not too rich, and completely addictive. 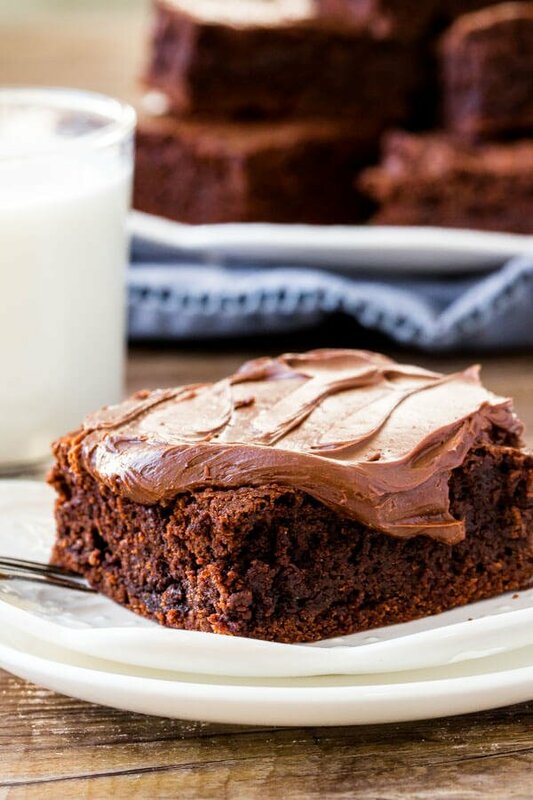 I love that it’s a super easy brownie recipe, and whether you have them with ice cream or plain, you’ll be in brownie heaven. Preheat the oven to 350F degrees. Line the bottom and sides of a 9x13 inch pan with parchment paper, or line with aluminum foil and lightly grease. Add the butter to a medium saucepan and melt over low-medium heat. Once the butter is melted, whisk in the cocoa powder. Remove from the heat. In a separate bowl beat the eggs and sugar for at least 4 minutes, or until they become pale in color and double in volume. Beat the eggs into the melted butter & cocoa powder. Using a rubber spatula or wooden spoon, gently stir in the salt and flour. Optionally stir in the chocolate chips or chopped nuts. Pour the batter into the prepared pan and bake for 30-35 minutes, or until the top looks set and an inserted toothpick comes out clean or with a few damp crumbs. Store in an airtight container at room temperature for up to 4 days. Brownies can be frozen for up to 2 months. Bake in an 8x8 inch pan for 30-35 minutes, or a 9x9 inch pan for 25-30 minutes. These look so yummy! Which cocoa powder do you like for these? And when you say beat the eggs and sugar, do you use a handheld mixer, stand mixer, or whisk by hand? Thanks so much!